Hello everybody and welcome to the blog! 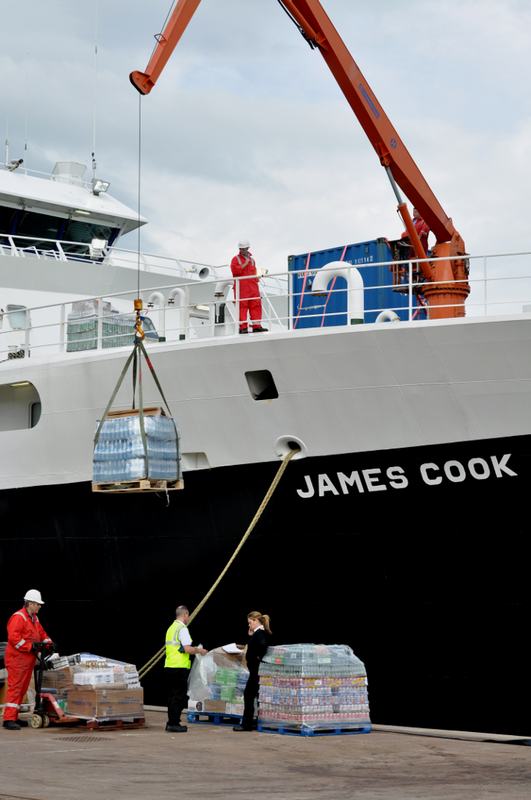 Last preparations are under way at the dockside in sunny Glasgow, as the crew and scientific party of the Royal Research Ship (RRS) James Cook (follow ship’s position in real time) are getting ready to sail for the "Down to the Twilight Zone" expedition tomorrow morning at 08:00. Before heading out to our destination in the North Atlantic, the PAP site, we will be going North for a short detour to recover a glider. Even though the location of this autonomous underwater vehicle can easily be found via GPS, it isn't an easy job to actually find the nearly two-metre long glider in the vast ocean. Therefore we were happy when at approx. 05:45 in the morning our glider expert, Gillian Damerell spotted the glider and around 30 minutes later the deck crew pulled it on board. The preliminary investigation showed that a small leak had caused the malfunction. However, for a proper analysis of the glider it will be taken back to land. Our general mission is to study the link between marine snow and marine microorganisms, like small crustaceans, in the twilight zone of the oceans. These interactions are strongly connected to our planet's climate, even though many details have remained a mystery up to now. So hopefully our work here will contribute to shedding some light on this dimly known region of the deep. The expedition is just one of several international expeditions this year, focusing on North Atlantic ecosystems as part of the EURO-BASIN and BASIN Initiatives. In fact as we are about to set sail, our colleagues on the Norwegian research vessels G.O.Sars will be concluding an expedition to Greenland, studying the boundary between the North Atlantic and the Arctic (follow blog and video casts in Norwegian and visit the G.O. Sars Facebook page, also in Norwegian). We hope you will sign up (on the right side of the page) for the regular updates from the “Down to the Twilight Zone” expedition and follow us, the scientists and crew, over the coming two weeks for some exciting science! Close your eyes and take a deep imaginary dive to the ocean abyss, preferably in early summer. No matter how hot it is where you might be, the abyss at this time is probably experiencing a short-lived blizzard of marine snow. The deep sea has its own climate it would appear, and a dense storm of fluffy particles coats the seabed, only to be gobbled up by deep sea creatures soon after. Technological advances allow multiple ways for observing the planet and its oceans from the comfort of an armchair and the click of a button, but understanding marine snow and how it links to the climate we are more familiar with, still requires ocean-going expeditions, and occasionally getting wet. The countdown is on for the “Down to the Twilight Zone” Expedition. Join the scientists and crew, as they set sail on the 31st May 2013. About copying or using media/images from this blog site. NOTE: all images in this blog are Copyright of the National Oceanography Centre and Christian Lindemann (except where indicated in captions) under a Creative Commons Attribution-NonCommercial 3.0 Unported License. Please contact us if you wish to use any images. NOC Expedition Blog template designed and developed by Rob Curry.